The Umbrella Movement in Hong Kong reads like a contemporary tale of David and Goliath. Peaceful demonstrators hold flimsy umbrellas to defend themselves against tear gas, pepper spray, and police batons. Their remarkable courage to remain defiant in the face of violent threats and attacks inspires us to confront hopeless situations with inner strength and truth. The month-long citywide protests by Hong Kong’s prodemocracy activists have drawn much attention to China’s latest attempt to restrict electoral reforms and prescreen candidates for the first direct election of the city’s chief executive in 2017. As a local story in the global struggle for democracy, the Umbrella Movement has made history for reasons beyond the public outrage over Hong Kong Chief Executive Leung Chun-Ying and has become a major test of crisis management for Chinese President Xi Jinping. The movement presents a powerful moral critique of the current autocratic system that China has put in place to appease Hong Kong’s business elites in the postcolonial era. Since the events are still unfolding on the ground, our reflection focuses on two distinct features of this unprecedented political awakening and engagement. The first concerns the moral bankruptcy of communist rule in Hong Kong. Political discontent and economic hardship set in motion the prodemocracy protests. The summer of 2014 saw a rapid deterioration of Hong Kong’s autonomy under Chinese rule. Less than a week after tens of thousands of citizens gathered in Hong Kong’s Victoria Park to commemorate the 25th anniversary of Tiananmen student movement on June 4, 2014, China’s State Council issued a controversial white paper to affirm its total control over the city. This has dramatically eroded any political goodwill China had built up with people of Hong Kong since assuming power in 1997 and has neutered the constitutional framework of the “one country, two systems” policy. The Basic Law, Hong Kong’s mini-constitution, guarantees that China’s socialist system and policies are not implemented in Hong Kong, and that the existing capitalist system and way of life would remain unchanged in both cities for 50 years. This political arrangement was initially designed to co-opt local business elites and ease the public’s fears over the post-handover era. The first deadline for Hong Kong’s transition passed smoothly on July 1, 1997. Since the Asian financial crisis of 1998 and the global economic meltdown of 2008, the city has fully recovered thanks to China’s rapid economic growth. However, the second deadline is approaching. By 2047, Hong Kong is mandated to be integrated into China’s political, economic and social structures. In addition, the Basic Law guarantees universal suffrage in elections for Hong Kong’s chief executive and legislators. The people of Hong Kong demand a direct democracy with equal participation for all the actors, and want to be involved in their government’s decision making process. They seek to create a constitutional mechanism that allows them to exercise their democratic rights. Nevertheless, China has only transferred political authority to its handpicked agents in Hong Kong. With its longstanding policy of denying full democracy to Hong Kong, China set out to dictate the outcome of Hong Kong’s elections by pre-empting significant electoral reforms in 2007, 2008 and 2010. Taking an active role in interfering with Hong Kong’s affairs, the Chinese government sent agents to the city to collect information and coopt pro-Beijing groups against the prodemocracy demonstrators. The agents still viewed Hong Kong’s politics through a Cold War lens, condemning the West for encouraging prodemocracy activists to subvert China’s communist state and ignoring local sources of political and socioeconomic grievances. These efforts to demonize opponents constituted an important part of China’s legal and psychological warfare against the prodemocracy movement. Seeking to put a brake on the city’s democratization, China even states that allegiance to the Chinese Communist Party is a precondition for becoming a chief executive. Unless the people of Hong Kong adopt the Chinese authoritarian mode of governance, Beijing will never allow them to elect their chief executive. While expressing their desires for genuine democracy, the prodemocracy protesters were propelled by many explosive factors such as a stagnant economy, rampant corruption, socioeconomic injustices, and an incompetent government void of democratic legitimacy. For decades, Hong Kong has suffered from a lack of economic diversification, and the government’s pro-business policies exposed the defects of a neoliberal capitalist economy, antagonizing both middle class and poor people. Since the late 1990s, the government’s approval of the importation of cheap foreign workers en masse has appeased the business communities at the expense of the well-being of local employees. The recent influx of Chinese real estate investment has fuelled an economic bubble and created a dearth of affording housing for young people. Worse still, China’s readiness to exercise its overwhelming, newfound powers further alienated Hong Kong. On several occasions, Chinese officials threatened to reduce freshwater and food supplies to the city to warn of the hard limits to freedom and democracy. Such threats revealed the awkwardness of the Communist leadership in resolving popular grievances and ruled out any hope of winning the hearts and minds of the Hong Kongese. This explains why the Umbrella Movement has spread beyond its initial student base to attract more frustrated white- and blue-collar residents. Another significant feature that defined the Umbrella Movement was the effective use of social media for civic engagement. Social media have awakened a whole generation of Hong Kong young people who are born after the withdrawal of British rule in 1997. Being the first generation in history to grow up in this age of global information technologies, the educated youth live in a boundless virtual world that is at odds with the realities of the futureless society they see around them. As with many progressive forces elsewhere such as the Arab Spring, the Color Revolutions in many former Soviet republics and the Sunflower movement in Taiwan, young people in Hong Kong expressed their grievances online and deployed electronic media to organize protests against the status quo. They organized themselves through Facebook, Twitter, FireChat, and YouTube on a scale that would not have been possible a decade ago. Furthermore, social media advanced the flow of ideas and opened up access to many levels of support. The Internet offered conscientious citizens endless opportunities for interactions and for increased access to multiple sources of information outside the pro-government media. This became a bad omen for the Chinese Communist Party and its collaborators in Hong Kong. Social media allowed citizens to bypass censorship and decipher the lies given to them through official propaganda. The tech-savvy youth constituted the backbone of nonviolent struggle from the beginning, and their enthusiastic embrace of social media mobilized more people to take part. New media served as an invisible electronic highway that transcended physical boundaries and permitted protesters to share information, exchange ideas for countering the riot police, and discuss new political visions and strategies online. Watching the Umbrella Movement in the U.S., we recognize that authoritarian regimes that rule by fear also rule in fear. Making people submissive and obedient was different from the art of winning trust and showing leadership. The determination of prodemocracy activists to confront the paranoia of their government has equalized the unequal power relations with the Communist leaders. Thanks to the diffusion of social media, the message of direct democracy has become easily accessible to the public. When the government sent in riot police and thugs to impose the rule of “might is right,” the intimidating tactics gave impetus to a new dynamic that raised public confidence in Hong Kong’s democratic movement. There was nearly universal outrage at the visceral scenes of the riot police harassing, attacking and brutalizing unarmed protesters on the television and YouTube. The tears and sweat of peaceful demonstrators not only inspired significant portions of the rest of the population to get involved, but also weakened the fragile unity that the pro-Beijing factions have enjoyed since 1997 and deprived the chief executive of what little legitimacy he had in the eyes of the citizens. The Umbrella Movement has shown us a fine example of direct democracy at work. People from all sectors of society took to the streets to make their voices heard, to challenge the political establishment, and to assert their rights in defiance of police brutality. The spontaneous occupations of several downtown neighborhoods gave a new breath to the city’s flagging desires for human dignity, freedom, democracy, and good governance, thereby rejecting China’s effort to impose top-down control in the electoral process. An ideational community was formed in an ad hoc manner to support those who occupied the public space and fought for the right to do so without fear and intimidation. The unprecedented scale of awakening has transformed Hong Kong into a politically active, profoundly dynamic and proudly cosmopolitan city on Chinese soil. The protesters declared themselves to be democratic citizens, gaining a sense of self-empowerment and remaking their hometown into a lively political theater. 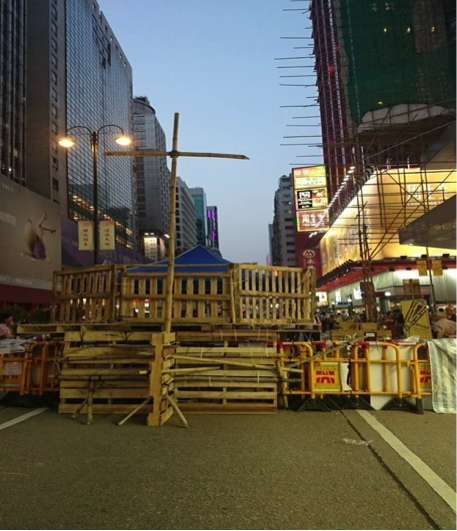 Several hundred colorful tents were set up across an eight-lane highway in Hong Kong Island’s central business district, preparing for a prolonged occupation campaign. 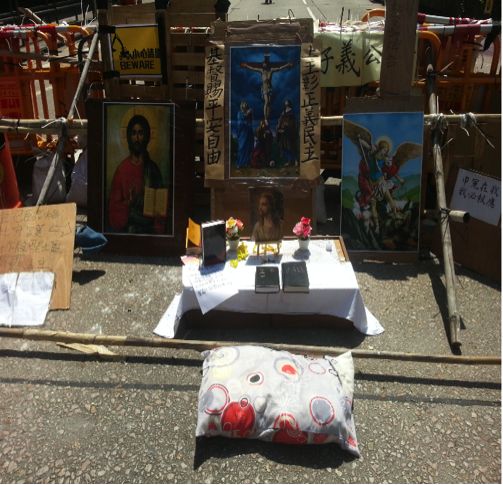 Some religious faithful put up a bamboo cross, the statues of Jesus Christ and Chinese warrior god Guan Gong at the protest zone in Kowloon’s Mong Kok district, seeking divine guidance in their struggle. 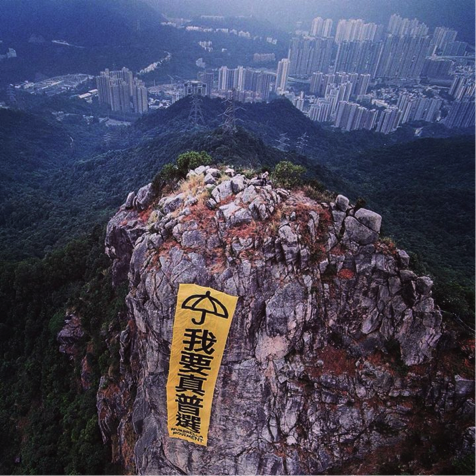 A group of mountain climbers hung a photogenic yellow banner on Kowloon’s Lion Rock Cliff to express their support for universal suffrage. Such large-scale, grassroots mobilizing efforts have galvanized the public to make legitimate demands of their government and to engage Chinese Communist leaders in negotiations about their political future. Photo 1: The riot police fired 87 canisters of tear gas at unarmed protesters on September 28, 2014. 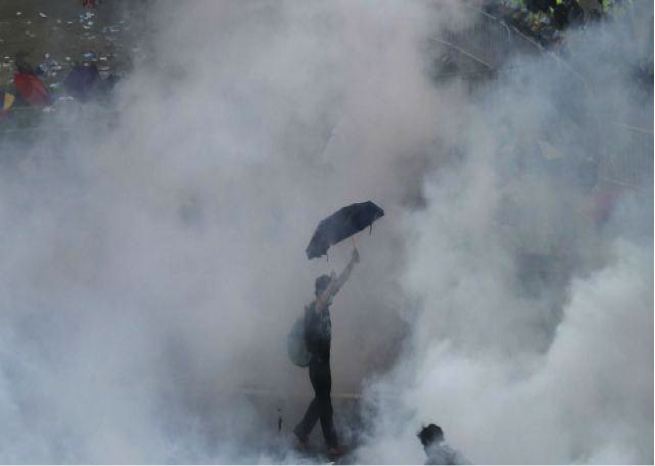 This photo captured the horrifying moment when a wave of tear gas engulfed an umbrella protester. 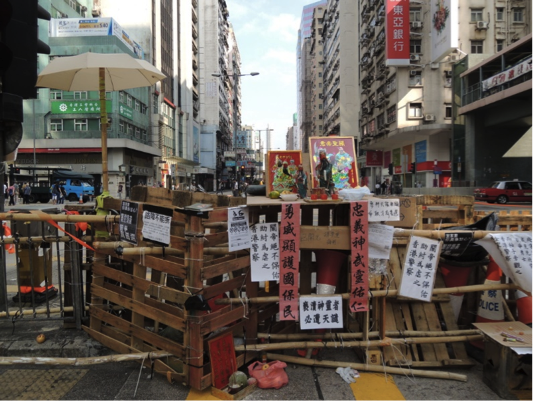 Photo 4: A bamboo cross marked the boundary of an occupied site in Mong Kok. Photo 5: Some mountain climbers unfurled a giant yellow banner upon the Lion Rock Cliff on October 23, 2014. It reads: “I want real universal suffrage. **Courtesy note: All photos are taken by anonymous street demonstrators and posted on the public domain.